How to transport a paramotor: 4 easy ways to get to the field! Gas powered paramotors are currently dominating the scene, but as technology improves electric paramotors will be huge competition. Let's look at the advantages of both to help you decide which one to buy. 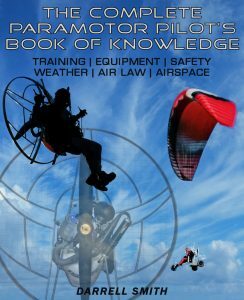 Since the first ever paramotor flight back in the 1980's 2 stroke engines have been the top choice of power unit for pilots. They're light but powerful, high revving and easy to maintain. 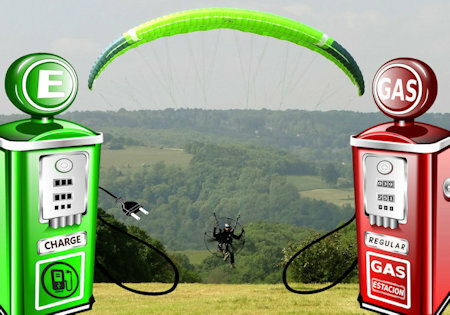 Although gas powered paramotors are still the top choice, electrically powered units are slowly gaining popularity. In Electric Paramotor VS Gas we'll look at the pros and cons of both to see which one comes out on top. Before we get to it I'll just note that I've used my current paramotor for most of these comparisons. I'm currently flying a Parajet volution 3 with a Vittorazi Moster Plus engine. I've used actual specs of an electric paramotor that went into production back in 2014. I haven't flown it, I don't know anybody who has, and I can't find any reviews online, but it is on the market which is awesome! My first question when I met the manufacturers of an electric paramotor at Parafest 2017 was "how heavy is it?". They told me that this is their most common question and that I'd be surprised when I lifted it. The paramotor had their standard battery pack installed but I picked it up and was very surprised. My Parajet volution with a Moster engine weighs 29 KG without fuel so the weight is exactly the same as the electric paramotor. Obviously this could vary slightly either way depending on your choice of frame and engine. Another thing we need to consider is the weight of fuel, for the same amount of flight time I'd burn about 4 litres. Many pilots don't take into account that a litre of fuel weighs about 770 grams, so for one hour I'd add 3.08 KG to my paramotor. You'd never want to land with an empty tank so you'd always add a little more meaning your takeoff weight would be about 33 KG. So which one wins this round? Electric paramotors definitely aren't as heavy as most of us pilots first think, but they may still be too heavy for some pilots. My Volution Moster combo is a weighty unit so it makes electric paramotors look great in terms of weight. But not all pilots want a paramotor as heavy as the Volution Moster combo! We already mentioned that ElectricPPG1 will give you about 50 minutes flight time. The guys that I spoke to at Parafest also told me that their electric paramotor would fly for an hour per charge. Unfortunately this is all we can currently expect from an electric paramotor as we're limited by the amount of batteries we can carry. This wouldn't stop you taking another fully charged battery or two to the field with you, but you'd have to land to change it. This means you probably wouldn't be doing long cross country flights on an electric paramotor. Some motors are more fuel efficient but my Moster will give me 3.5 hours flying on a full tank of gas (14 litres). This makes the paramotor super heavy but it can be done. If you fitted a smaller engine, for example a Top 80 then you'd get more than 5 hours of flight time per tank. Obviously gas paramotors win this round but not everyone want's to fly for hours at a time. I know pilots that enjoy a quick 30 minutes in the air, some even less. And not everyone has the time to spend flying for that long, so electric paramotors could be a winner for some. The ElectricPPG1 motor is putting out 14 horsepower and 54 KG of thrust. The Vittorazi Moster puts out 25 horsepower at 7800 RPM and 68 KG thrust. Of course this will again vary considerably between engines. A Top 80 engine will give you 15 horsepower and 48 KG thrust, similar to the electric paramotor. A Thor 250 gives you 36 horsepower and 85 KG thrust, lots of power but way too much for most average sized pilots. There's no real winner of this round, it all depends on what you weigh and how much power you need. A larger pilot will never have problems with a powerful gas powered engine but 54 KG of thrust from an electric paramotor will still get most pilots off the ground. Just for comparison my old Parajet V2 Compact had 55 KG thrust and lifted me off the ground easily when I weighed 205 LBS. ElectricPPG1 have also quoted the maximum pilot weight at 200 LBS. The price of ElectricPPG1 is currently set at $14,645. At one point they actually stopped production temporarily due to the battery manufacturer raising the prices by thousands. As technology gets better and cheaper prices will become much more affordable. When you buy an electric paramotor the only running cost you'll have is the price of electricity to charge the battery. Charge time is about 2-3 hours but without a battery to look at I'm unable to work out how much a charge will cost. If electric cars are anything to go by you'll be looking at about 1/4 the cost of buying fuel for a gas paramotor. Of course batteries will eventually need replacing as they only have a certain cycle life. The cycle life is the number of complete charge/discharge cycles that the battery is able to support before its capacity falls under 80% of it's original capacity. ElectricPPG1 claim their paramotor battery has 1000 Cycles, or 1,000 Full Flights. So realistically most pilots will easily get over 10 years worth of flying out of a battery. You may be interested in my separate post where I was able to work out my actual yearly running costs HERE. In the article I explain how it costs me £5.85 to fly for one hour. This will obviously vary from country to country depending on your fuel prices, it will also increase as fuel and oil prices do. My annual fuel costs worked out to £526.50 ($702.69) based on 90 hours flying. You'll also need to replace things like spark plugs and reduction belts every 25 hours or so. Eventually engine parts also need replacing, you can expect to replace pistons, clutches, pull starters, etc every 200 hours, maybe sooner. My Moster engine also needs a £20 exhaust bush every 15 hours of flying. I think gas will win this round for most people but in the long run you won't be any worse off. The price to buy an electric paramotor new is almost double what I paid for my Parajet at £5,792.77 (The price of ElectricPPG1 coverts to £10,972). If fuel prices remain the same, which they won't as they always increase, you'll spend they same flying a gas paramotor in just under 9 years. But if you take everything into account for both gas and electric paramotors, fuel and electricity, engine parts and spares you'll break even a lot sooner. I think batteries will be very safe as long as they aren't being charged during flight. We've seen problems with certain batteries being fitted to electric start paramotors in the past, but this was always due to in flight charging. There will be no need to start the paramotor on the ground before strapping in so electric paramotors could make prop strikes a thing of the past. Gas paramotors are unlikely to suffer from any in flight issues. We see the odd jammed throttle cable causing motors to go to full power, but pressing the kill button soon solves to problem. The main problem with gas paramotors happens on the ground whilst warming up the engine. This is avoidable with pre-flight checks before starting the engine and correct training. I've got an whole article dedicated to prop injuries and how to avoid them HERE. Electric paramotors have the potential to be much safer on the ground, but until we see more of them in the air in-flight safety is a bit of an unknown. As with everything it may take manufacturers a little trial and error to get things perfect but eventually we'll be looking at very safe flying. 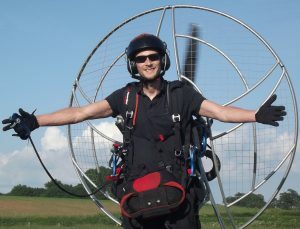 An electric paramotor will be much quieter than gas but it may surprise you that most of the noise comes from the prop. If you've ever heard a drone flying you'll know how loud propellers can be. Even so an electric paramotor will be much quieter making flying more pleasant for the pilot and reducing the noise nuisance for people on the ground. As well as the prop noise you will be getting a lot of noise from your engine. This comes from the intake, re-drive and exhaust. When you're flying at full power with trims out the constant drone can be very overpowering. I wear ear defenders but they proved insufficient on longer flights, so I also wear ear plugs to protect my hearing. When you go to a fly-in you realise just how smelly and polluting a two stroke engine is. When you have 30 paramotors puffing out fumes all over the field the air soon becomes thick with the smell. When I get back home from a long cross country my girlfriend always comments on how much I smell of fumes/oil. I also notice it in the air sometimes when I'm powered down or when I'm flying circuits. Electric paramotors win this round as they're much quieter, there's no smell, and additionally they're not emitting greenhouse gases which is always a good thing. Another plus is that they're cleaner, a two stroke engine will always drip oil from the exhaust and leave a sludgy mark on your propeller. This will be a problem of the past with an electric paramotor. Travelling with an electric paramotor could be much easier than gas. You can remove batteries to make the paramotor much lighter and easier to load into cars or onto racks. Transporting an electric paramotor in your car will be much more pleasant, anyone with a gas motor knows how the fuel fumes quickly fill the car even on short journeys. And then there's the risk of fuel leaking into your vehicle, this has happened to me and it's not nice. You'll be able to lay the electric paramotor horizontally with no worries of anything leaking out. If you wish to take your electric paramotor abroad you may need to take take it on a plane. Not to worry as the airline will let you carry the motor and batteries on the plane with you. We just mentioned that fumes can quickly fill a car on any journey, especially on a hot day. This is unavoidable as fumes still remain in the tank even after draining it. If you have a small car you may need to lie your paramotor down, so you'll need to drain the fuel every time you load up. This still won't prevent fuel from leaking out of the carburettor, so you may need to drain the whole fuel system each time. Travelling on an airline with a gas paramotor can be a pain. As you know fuel and oil are classed as explosives / hazardous materials so you will need to clean the whole system. Even a slight smell of fuel can prevent your paramotor from being allowed on the plane. I've shipped a paramotor abroad and removing any trace of fuel smell is very difficult. I mentioned earlier that I couldn't find any reviews on the ElectricPPG1. It's hard to know how reliable an electric paramotor will be initially, but there is potential for excellent reliability. You only need to look at electric cars, or things that use high RPM electric motors like drones and RC models to see how reliable they could be. Again, a little trial and error may be needed as electric motors can burn out and batteries can fail but expect very reliable paramotors in the future. Unfortunately engine outs are a common thing with gas paramotoring. Highly strung 2 stroke engines can be very unreliable, coils fail, pistons melt, bearings break up, etc. 4 stroke engines will give better reliability but they're much heavier. So which one wins for you? As technology improves and prices drop I think electric paramotoring (EPPG) will definitely take over in the near future. Some of the pluses of EPPG are very tempting, and with a few tweaks I could definitely see myself making the change. But for now gas wins for me and it's simply because of the initial investment needed to own an electric paramotor. A longer flight time would also be a big plus, so I'd have to keep my gas motor for longer cross country flights. I think battery technology will improve dramatically as we see more electric powered vehicles being produced. From what I've read from ElectricPPG1 the cost is the main thing holding this back. We are very very close to having the affordable technology to make this a reality, and it's just a matter of time until EPPG is the first choice for pilots around the world. If you're a beginner looking to get your first paramotor then check out my guide on choosing your paramotor and engine HERE. Or read a review of my current paramotor HERE. There is another one in Michigan your forgetting. like them because they are selling the parajet and to me is one of the top 3 Cages in the industry. I dont know a lot about the training Facility. But will be looking into them soon for my self to take some classes. Jeremy “Jay” Langejans is the first instructor in Michigan in 2013. I think his training cost are a little ridiculous but normal if you buy a cage from him with in a yr and then you save 1000$ on your training. haha what a gimmick. You save a 1000$ but might pay more for a Parajet. Who knows . Just thought you should have his site included. I like the equipment he is selling much better and yes its not american made I understand all that, but your life depends on the very best, thats how i see it. But I do like the idea of paying for each day you can get training like at Michigan Powered Paragliding. Some flyers might only need a one day or two day some might need a 4 day 🙂 and some places give you unlimited training. But I am a believer in a good training experience then get out and get your own flying training in. 🙂 God bless.